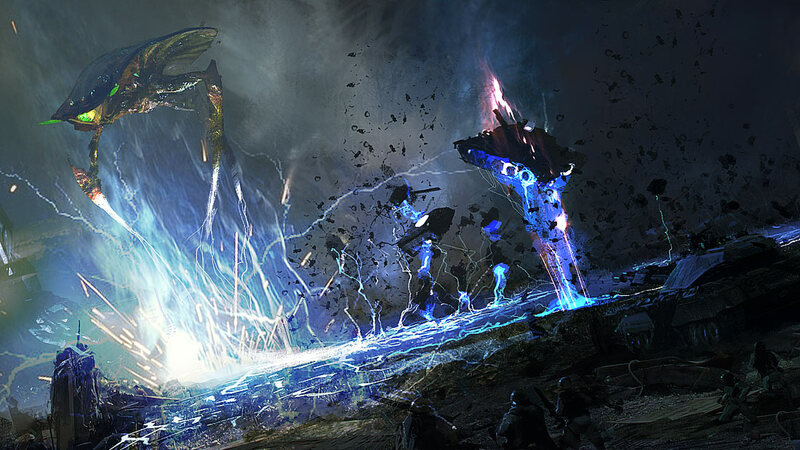 Subject description: From the Tiberium Twilight concept art.. I wanted this to be put alongside a bunch of other voxels which I'd found buried in my voxel folders and fixed them up for release. But I couldn't get them done in time, so you'll get them later! This one is based on leaked EA concept art with the Scrin Primal blasting to hell a human task force. I've made two versions, one which is a grey plain one, similar to the concept art, and a golden one, like the gold version of the TFD Concept Tank voxel I did. EDIT: Uploaded new version, with bigger turret (should have no offset in the art.ini for best results). The preview has also been updated to the new version. Concept Art I based it off. Its the tank in the lower right corner. thats one damn sweet piece of steel. Muldrake, you do some exceptional voxel work. Oh, and I love the new assault/recon bike you did for Nod in TSD, thank you, good sir, thank you. Increased the turret size, as well as centralising it. Any better Raminator? Also, the original previews has only auto-normals, I had in fact improved the normals for release. Also, think it would be worth adding some texture to the tanks? Namely the grey one, it does seem overly plain at times.. Thanks for the comments, and yeah, Concept work is often nice as it doesn't always include the complete unit design, so it gives you a little flexibility in some features. Sometimes I just love a concept art piece, and although incomplete, it gives me an idea to develop. Very good Muldrake. But the concept you based your vxl upon is way too dark :\ I don't know if this makes the tank an accutrate model or not. And thanks Gosho, but as I've said, the detail and model from the concept is very limited, but it still gives me a direction to work in. As a result, it cannot be said whether its accurate or not, I mean with the gold version I added all the remap stripes and the like to help it fit in with the other recent TT Tank concept which was released. I may try and add some more texture to the units before giving another release, but I have work today, so that maybe not until tomorrow. And I'll try and have the other voxels up soon. A very delayed christmas package this turned out to be! And thanks again for the comments. Anderwin.. if it looks weird, fine.. I'd prefer a comment to go with it as to WHY it looks weird so maybe I could improve it? I could bounce in happiness...that tank deserves a stand in spotlighted voxels! Muldrake is being too damn modest. Spotlighted. Oh sry i write why =S. Anyway i can write it again. The turret look a bit odd. Mabye make the barrel black? Why is it white on it? On the picture is look is more grey then light grey or white. I dont know what u have use. Same with the grey version. The grey turret i think should be a bit bigger and is look a bit messed. The turret look is go inside the body. The yellow on the button on the turret is look find if it got the blue thing around and not stop on 50%. I will say no spotlight but this is what i mean. Mabye make the barrel black? Why is it white on it? On the picture is look is more grey then light grey or white. I dont know what u have use. Same with the grey version. Why very light grey/almost white at the tip of the barrels? A trick I learned from TS voxels: Contrast. You want to know which direction the barrels are pointing, and you want to know quickly in a battle, and for the most part, a brighter colour will be seen, as well as it being a colour different from the rest of the colours used on the voxel. There is a remap/blue on the bottom of the turret? And it does go all the way around the bottom. The reason it doesn't cover the back is due to the shape of the turret. Look at the concept art, the back bit is like a shelf, it is not connected via the bottom of the turret. Sorry to bumb an old topic, but I think Muldrake should make a V3 out of this with the help of the left-over image(s) of Tiberian Incursion. Seems like the tank was a lot thinner and longer than what Muldrake's tank is (though I can understand this when you had a single pic to use as an example), and the turret is smaller. wait? wheres the V2 download? or is it the one at the top, just replacing the old one? Do you see, how big is this necroism?